At Innovative, we know that caring for children is vastly different than treating adults. We have a pediatric orthotic team devoted to treating patients ranging from infants to adolescents. Innovative P&O offers a full-range of rehabilitative products and services, including custom solutions for conditions such as Plagiocephaly, Scoliosis and Cerebral Palsy. Our multidisciplinary approach to pediatric bracing and support services addresses each child’s unique needs. Your little one will receive individual attention and high-quality, outcome-based care from infancy through adulthood. Just as children are continually growing, our pediatric orthotists grow through commitment to advanced training and ongoing education to be at the top of their field. For you, that means your child has access to the latest technologies and pediatric clinical expertise. Innovative Prosthetics and Orthotics offers clinical leadership and creates mobility solutions from head to toe, addressing the head, neck, back, lower limbs and upper limbs with pediatric orthotics. Seeing an irregular head shape on your baby, and the thought of treating him or her with a cranial remolding orthosis (CRO), also known as a band or helmet, can be overwhelming. We are here to make things simple and to provide your family with the resources you need to make an informed decision about plagiocephaly treatment. Innovative is a leader in treating babies with cranial asymmetry, the most common type of which is plagiocephaly, sometimes called “flat head syndrome.” Our certified orthotists follow our clinical practice guidelines for the conservative treatment of plagiocephaly, which have been published as an industry benchmark. Early detection and prevention is key to successful treatment. If you are concerned about your baby’s head shape, talk to your pediatrician or contact Innovative for your free initial exam. There are three common asymmetrical head shapes, which are easiest to see from the top looking down. If you don’t recognize your baby’s head shape below, consult your Innovative Clinic orthotist. Subtle differences are possible within each of these broad categories. Plagiocephaly (play-jee-oh-sef-uh-lee) can usually be identified by flattening on one side of the back of the head, and one eye or ear may appear higher than the other. Brachycephaly (brake-ee-sef-uh-lee) generally appears as flattening across the back of the head with a prominent forehead, and the height of the baby’s head may appear taller. Scaphocephaly (skaf-uh-sef-uh-lee) is typically observed as a long, narrow head shape. Congenital muscular torticollis (CMT) is a tilting and/or turning of a baby’s neck to one side as a result of a muscle strain to the sternocleidomastoid (SCM) muscle that runs along the side of the neck from your clavicle to the back of your ear. When this muscle becomes tight or weakened, your baby’s head tilts to one side and/or turns to the opposite side. 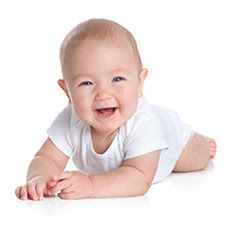 CMT is seen in approximately one in 250 babies. Torticollis can cause or worsen plagiocephaly and requires separate physical therapy treatment. Talk to your doctor if you think your child may have CMT. Craniosynostosis is the premature fusion of all or part of the sutures, or joints, that connect the bony plates of a newborn skull. This condition usually requires surgery before further treatment. An early sign of plagiocephaly is when creases form on one side of the neck from your baby’s head being cocked to one side. Over time these creases can turn red. One of the best ways to look for asymmetry is to look at your baby’s head from above (the bird’s eye view) while his or her hair is wet. Babies tend to spend more time with their heads flat against firm surfaces thanks to our busy lifestyles, the Back to Sleep program and car carrier seats. That’s why tummy time is more important than ever. Tummy time includes any activity where your baby’s head is not flat against a surface. It encourages head and neck control and relieves pressure. Repositioning is a focused effort to change the placement of your child’s head to reduce the risk of flat spots. An example is laying your baby’s head on the left side at bedtime tonight and on the right side tomorrow.